Located in a small village in the Middle Atlas, these waterfalls are considered the highest and most beautiful in the country. They have an approximate height of 110 meters, and are born from the Ouzoud River. It is the most visited site in the region, and is surrounded by green valleys, mills, orchards, and the Gorges of the Abid River. Ouzoud Falls are a major tourist attraction in Morocco. They are at their most spectacular in the spring following heavy rain . You need to be reasonably fit for this excursion as there are a lot of steps involved. Another attraction of the falls area is the endangered Barbary Apes which, although wild, have become well used to tourists. 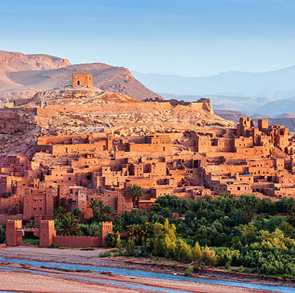 Delve into one of the most exotic landscapes in Morocco. Surround yourself in the emerald green and olive of the fascinating Ouzoud Waterfalls, which, with a rise of 100 meters above sea level, are the highest in North Africa. Take advantage of this day trip from Marrakech to Ouzoud Falls to get away from the arid landscape of the country and enjoy the contrast which gives us the greenery of this area. We will begin our day trip from Marrakech, and travel 150 km to the Tanaghmeilt Province, where the Ouzoud Waterfalls are. Arriving at Ouzoud, we will enjoy the unique landscape and fauna, which are rare in Morocco. The Ouzoud Waterfalls are the largest in Africa, and the filtrated rise of 110 meters is what gives strength to the waters of the El-Abid River. We will descend down a path that will take us to the bottom of the falls, where we can feel the power and roar of the water falling from such great heights. We will also have the opportunity to browse in the small craft shops that are along the way. The hottest and bravest can enjoy a swim in the river. Additionally, with a little luck, we will have the opportunity to see some of the monkeys that wander around the area. After eating, we will begin our return journey back to the city of Marrakech.